"And how accurate is the information that your mosaic (smalt) has no analogues in the world?" - such questions were increasingly being asked by potential customers. And then we decided to do a little research on this topic. While on the Internet, we have not found anything like our products. But we had the chance to make an interesting digression into the history of European antiquity. Having read the study of the British Museum staff member PhD Daniel Howells, we realized that we probably will not find analogues for a very long time, since it is believed that the secret of this technology was supposed to be lost forever and irretrievably. We also realized that we have advanced in this technique even further than the ancient Romans, because we can combine together with the gold image in the sandwich-glass also a luminous layer, and if desired, add a pigmented paint layer. At this high temperature, burn and fuse both layers of glass, that the resulting monolith, with perfect fused edges, can be used as a ready mosaic for hammams, Roman baths and baths. This type of artefacts, which has the English name "Gold glass", in French is called "Glass Eglomise" (Verre églomisé), although this technology is not exactly an analogue of the ancient Roman archaeological finds. The Italian name of this product sounds even more beautiful – "Fondi d'oro". Dating principally to the 4th century and bearing well preserved depictions of recognizable and often Christian subjects executed in gold leaf, gold glass has attracted the attention of scholars and collectors since the first examples began to be recovered from the catacombs of Rome in the late 16th century. However, gold glass as a medium has never been fully examined or analysed, and the core reference works on it that exist are almost all over 100 years old. The British Museum holds one of the largest and most important collections of Late Antique gold glass in the world, numbering over 50 pieces, and surpassed in size only by the collection of the Vatican Museum in Rome. Although a select number of objects from the British Museum have been exhibited on numerous occasions, the collection as a whole has only been the subject of two catalogues raisonnés: one by O.M. Dalton in 1901, and another by C.R. Morey in 1959, both of which were incomplete. This catalogue, using the British Museum’s collection as the basis for an in-depth case study of Late Antique gold glass, provides a detailed examination of the British Museum’s collection of gold glass, combined with a considered study of a wide range of scholarship concerning Late Antique images, archaeological sites and cultural expression. It also draws upon the results of the scientific analysis of the British Museum’s gold glass collection to give a detailed overview of the medium as a whole. The opening chapter examines the history of gold glass scholarship from the late 16th century up until the present day. This serves to demonstrate the origin of many of the frequently repeated assumptions regarding gold glass that can be found in the recent literature. The validity of these assumptions is then assessed in later chapters. Chapter Two provides a brief account of the scholarship concerning the British Museum’s collection of gold glass. This collection was formed during the second half of the 19th century and the exact dates of acquisition are recorded for the vast majority of the objects. Consequently, it is possible to consider the formation of the collection itself in the context of the changing 19th-century attitudes to Late Antique art. Chapter Three examines questions of morphology, outlining the various gold glass subtypes and the respective forms recognizable in the British Museum’s collection. 1. Gold glasses produced in the ‘cut and incised technique’, often depicting Christian-related imagery, constitute the most numerous and well-known category. In each instance, the image is literally cut and incised into the gold leaf. There are three forms of cut and incised gold glasses. The most common take the form of vessel bases, sandwiching an image cut and incised from a sheet of gold leaf between a glass base-disc and an overlaying colourless layer of glass forming the vessel bowl. These I will refer to as ‘cut and incised technique vessel bases’. The second type is referred to as ‘diminutive medallions’. Employing the same technique of design incision as the vessel bases, they constitute small coloured glass ‘blobs’ applied to the wall of a larger vessel sandwiching the design between the coloured backing and the outside of the colourless glass vessel wall, making the design visible when viewed from the inside. The third and final type are referred to as ‘gilt glass plaques’. Again, the technique of design incision into the gold leaf overlaying a single layer of colourless glass is the same; however, in this instance the image is not overlain by a second protective glass layer and the objects did not constitute vessels in any form. 2. 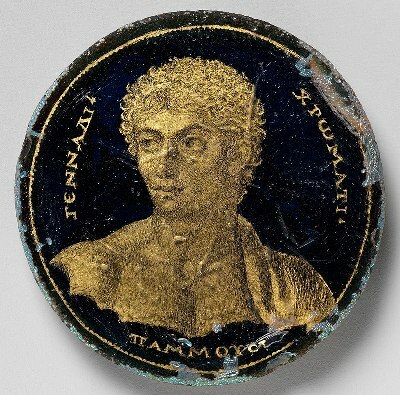 Brushed technique’ gold glasses take the form of highly naturalistic portrait medallions with cobalt blue backings. They are termed as such because the delicate incisions in the gold leaf forming the image that is enclosed between the two layers of glass are produced with the precision of a gem-cutter, apparently simulating brushstrokes. 3. Gilt glass trail technique’ refers to the bases of vessels with a glass trail inscription covered in gold leaf sandwiched between two layers of colourless glass. Chapter Three also offers a discussion of the large-scale scientific analysis of gold glass by Andrew Meek, which was carried out as part of this project. On the basis of the morphological and compositional overview, Chapter Four examines gold glass production methodology. The evidence of past attempts at gold glass reproductions, including fakes and forgeries from the 18th century onwards, as well as the historicizing reproductions of gold glass produced in the late 19th century in the British Museum’s collection, are looked at in detail. Alongside an analysis of surviving medieval accounts of the simultaneous working of glass and gold leaf, this provides the basis for an extensive examination of gold glass production methodology. The results form the basis of the discussion concerning the perceived material value of gold glass in Late Antiquity. Based on an extensive review of the literature (the data from which is presented in Appendix A), Part One closes with a discussion of distribution and context, effectively demonstrating that findspots of gold glass are in no way restricted to the catacombs of Rome and the environs of Cologne, as is usually stated. All of the preceding analysis will be drawn together in order to analyse the current understanding of gold glass workshop identity and to consider the possible functions of gold glass in Late Antiquity, using the conclusions drawn earlier to assign the various gold glass subtypes to distinct chronological epochs, each lasting perhaps only a generation. The catalogue forms Part Two of the volume. Objects are presented grouped by iconography and within that categorization in chronological order of acquisition by the British Museum. Throughout the book, specific gold glasses in the collection will be referred to in bold by their catalogue number. The catalogue discusses in detail the range of iconography appearing on gold glasses in the Museum’s collection, reflective of the medium as a whole, in the context of other contemporary media. This will cover portraits and portrait-style depictions of secular people and groups, often with Christian connotations, in addition to portrait-style depictions of Christian saints and biblical scenes. Finally, I will look at the lesser known subjects to be depicted in gold glass, including distinctly Jewish and pagan images, inscriptions unaccompanied by visual embellishment and purely secular scenes.